I can't believe this is the last post about my Australian Adventure. 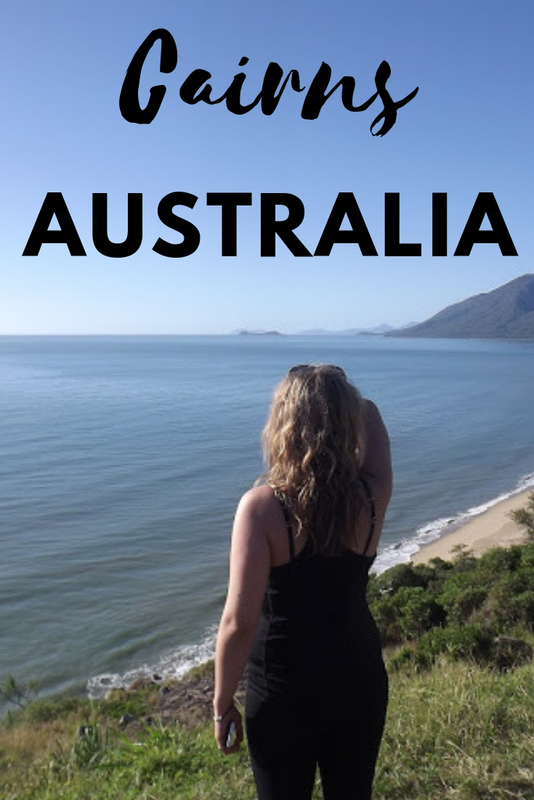 Writing these posts has allowed me to really think about all the things I did when I was in Australia and reflect on what a great time I had. I'll be honest, I didn't really have a huge desire to go to the other side of the world but it is undoubtedly one of the best things that I have ever done!! We were really busy in Cairns. We spent our 2 full days on planned day trips. The Great Barrier Reef: Although we had technically already snorkelled on a part of the Great Barrier Reef down in the Whitsundays, we jumped at the chance to snorkel again. We booked a day trip out onto the reef with a trip very similar to this. Controversially - I thought that the snorkelling was actually better in the Whitsundays. That being said, you couldn't get me out of the water! At one point I was swimming away, minding my own business, and a shark swam right past me!! It was a harmless little thing that couldn't care less about us, but it does take you by surprise. If you plan on going on a boat trip, I would recommend that you bring lots of layers. Not only does it get cold, but once you and your towel are wet it gets uncomfortable! Cape Tribulation Tour: We did so much on our trip to the rain forest, it almost needs a whole other blog post. Our guide, Stu, was a crazy Kiwi who added an extra streak of mischief into the day - like when we watched as two guys jumped out of their boat into crocodile infested water and he was laughing hysterically, or when he kept getting us to eat sugar canes?! Our first stop was Mossman Gorge or 'Wurrumbu' in the Daintree National Park where we were introduced to members of the Kuku Ylanaji Tribe, who are the traditional owners of the land. They spoke to us about their culture as we took part in a smoke ceremony. It's just what tourists are after, but also very interesting so worth visiting. It was then onto the Gorge for a swim. It might have been hotter than England ever is in the summer but the water was still far too cold for me to go in! We then went on a guided walk of the rainforest - which is one of the world's oldest. The walk we did was around the Marrdja Boardwalk so not quite Tarzan style but still amazing! We stopped for a lunch of Kangaroo Burgers - not even joking - at Cape Tribulation Beach before heading to Alexandra Range Lookout where the rainforest meets the ocean. Absolutely stunning! When I say we didn't know what to expect during this trip, I mean, We. Really. Didn't. Know. Not only did it seem an age since we had booked but we weren't sure what was planned and what Stu was throwing it spontaneously! Just when we thought we were heading home, we stopped off at another place and were told we were going on a Wildlife River Cruise. This was probably one of the highlights of the day because it was essentially a surprise to us. We saw crocodiles in the wild - and even a python curled up in a tree! It was a taste of the 'Wild' Australia that I expected to see everywhere! We made our way back to Cairns, stopping off on Port Douglas beach just in time for sunset. A great end to the day. Whilst back in Cairns, we visited the Cairns Night Market before heading out for drinks with friends we met along the way. The next day it was back to Sydney. What a trip! Loved reading this! I've been living in Cairns for a few weeks now and both of those trips are great. Sorry we didn't get the chance to catch up while you were here. Safe travels! Now I have another city to add to my Australian travel wishlist!! But I think summer, despite the cold, looks like a good time to go as well! Yes, definitely. We were there in the Australian winter - and it was much warmer than any English winter I've known! !